WASHINGTON, DC—Taylor Swift wanted to send a message to Tennessee lawmakers today. Responding to their slate of anti-LGBTQ legislation, Swift, who is also a Tennessee resident, made a $113,000 donation to the Tennessee Equality Project (TEP), the state’s leading LGBTQ advocacy organization. The singer made the donation on Monday, in response to the 12 bills (6 from the House and 6 from the Senate) promoting, according to the Huffington Post, “discrimination rather than justice.” TEP had put together a “People’s Petition Against the Slate of Hate” online, opposing the bills. “…They promote discrimination rather than justice and demean the worth of LGBTQ people in our state. We call on people of good will to join us in speaking out for basic fairness,” the group’s petition read. Others were quick to react to Swift’s actions. “From famous musicians to faith leaders of diverse denominations, Tennesseans from all walks of life oppose this slate of anti-LGBTQ legislation,” said Kasey Suffredini, President of Strategy at Freedom for All Americans. “The bottom line is that no one should live in fear of discrimination because of who they are, who they love, or which community they call home. 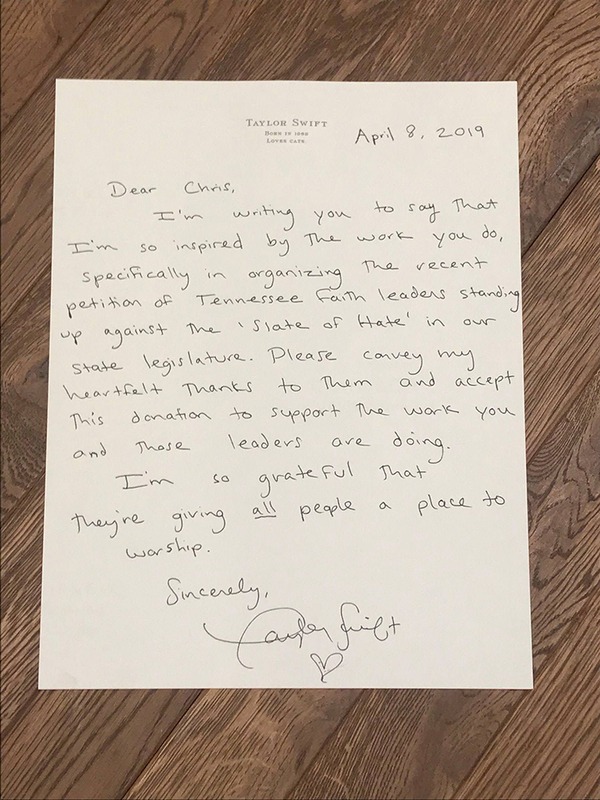 This is Swift’s letter accompanying her donation to TEP. Chris Sanders, the organization’s ED, announced via a Facebook post. Swift joins hundreds of opponents, said the Huffington Post, including more than 120 faith leaders across the state who in March signed a statement denouncing the anti-LGBTQ measures. Social media erupted in reactions over the singer’s donation and support to LGBTQ causes. Be the first to comment on "Taylor Swift Makes Record-Breaking Donation In Opposition To Tennessee’s Anti-LGBTQ Bills"